Who is this girl anyway? ~ A modern career girl and mom time travels… in the kitchen. I love history and I love food! 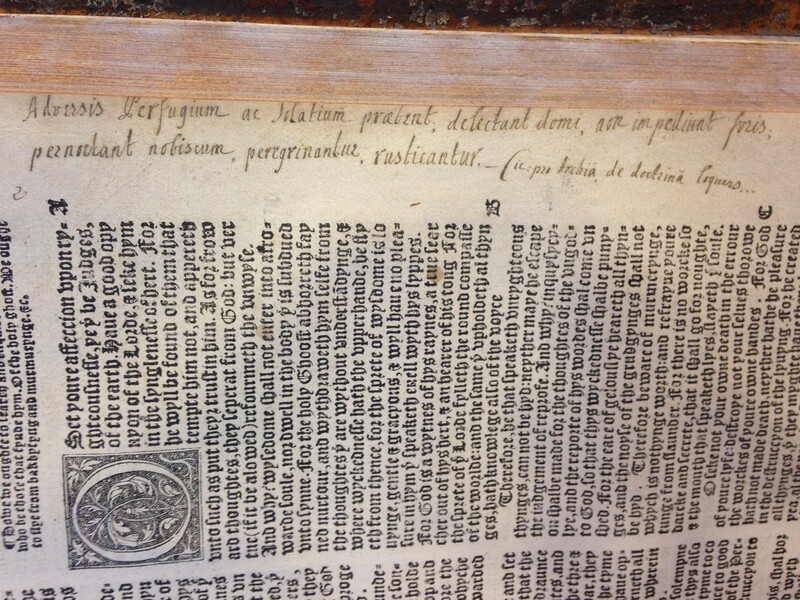 This recipe, inspired by my post about the Great English Bible of 1541, was a little bit a challenge for me. It took me several tries to get it right, in terms of handling the dough and making them look right. I also believe the translation in the book I’ve been using, Tudor Cookery: Recipes and History was incorrect in terms of the amount of some of the ingredients. Nonetheless, I really loved these. This is a sweet biscuit, meant more for breakfast, in my opinion. It has a taste unlike any other bread or biscuit I’ve ever had before! 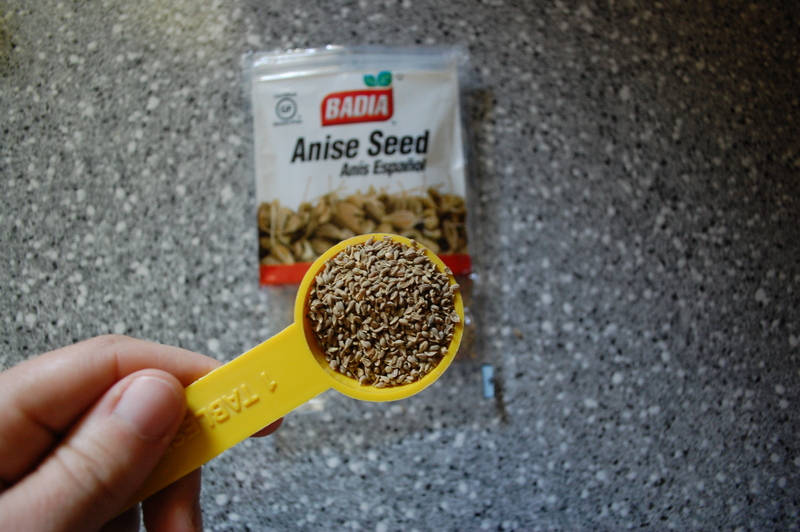 Its made with aniseed, which gives it a black licorice flavor. This is a great conversation starter, particularly for bread lovers. The original recipe comes from The good huswifes Jewell, pt. 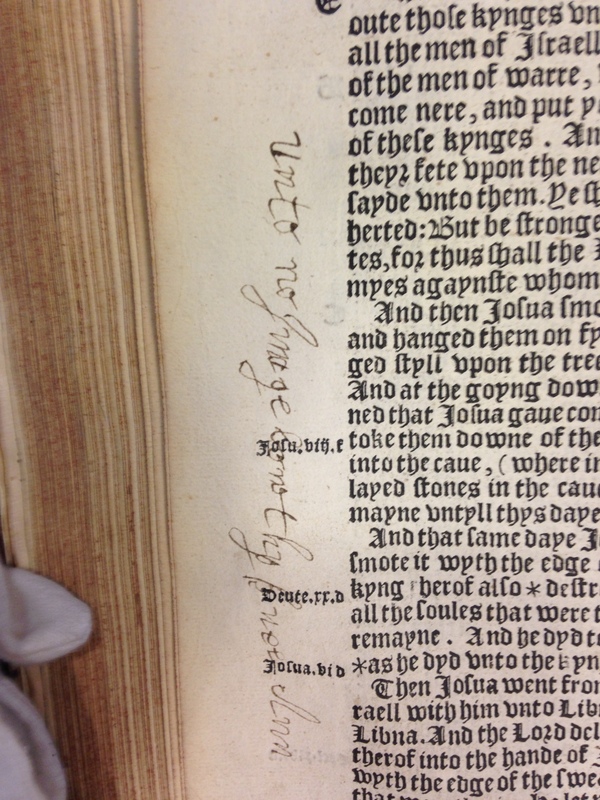 2, published in 1596, but was translated in the book I used called Tudor Cookery: Recipes and History by Peter Brears. 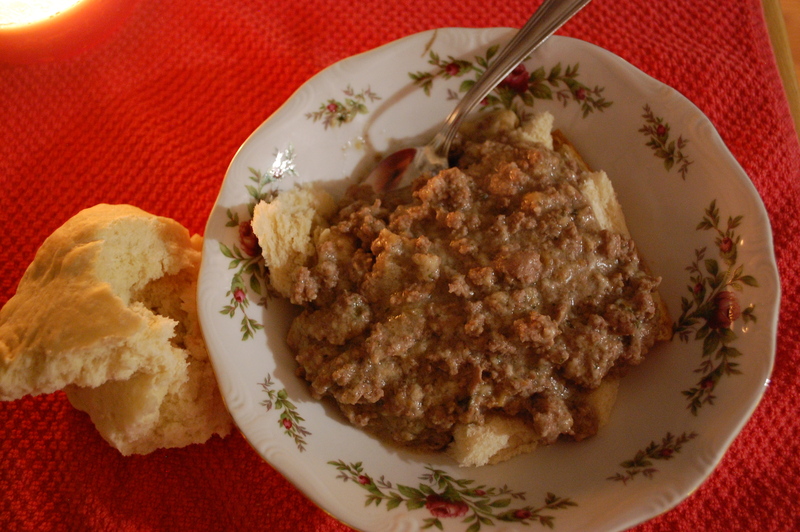 The Brears version calls for 6 ounces of flour, which is three quarters of a cup. 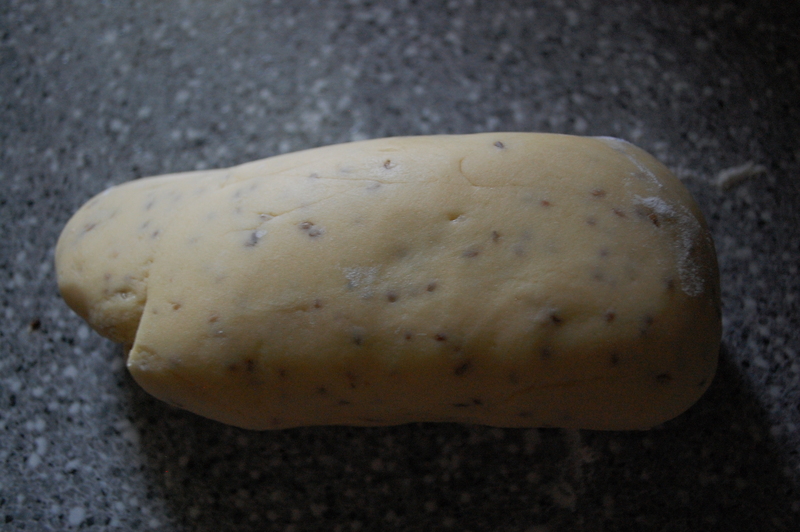 This creates a dough that is like runny cookie dough… completely sticky and unworkable. I believe I have corrected the amount of flour, ( I think he really meant 16 ounces-possible typo?) which creates a biscuit that gets crisp and brown on the outside and chewy on the inside. Beat the eggs in a large mixing bowl, then beat in the sugar, aniseed or caraway, and finally the flour, forming a stiff dough. 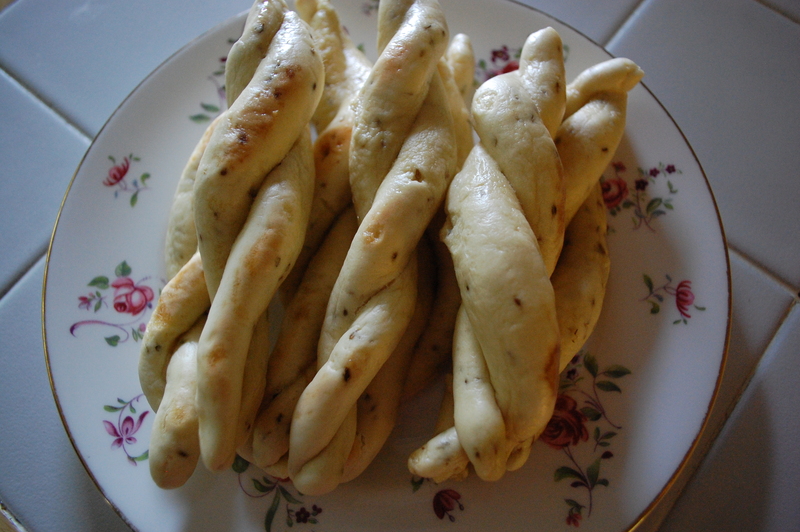 Not the best photo, but you can see the consistency the dough should have before you make the twists. Knead the flour on a lightly floured board and form into rolls, approximately 1/2 inch in diameter and about 4 inches long. Take two of these lengths and twist them together to form a knot, pressing the ends together to prevent unraveling. Bring a large pot of water to boil. Plunge 3-4 knotted biscuits into the water at a time. At first, they’ll sink to the bottom of the pot. Leave them alone for about 30 seconds. Then using a slotted spoon, dislodge them from the bottom of the pan and let them float and swell for about a minute or two. Lift them out and drain them on a tea towel for about five minutes. Heat your oven to 350 degrees and line a cookie sheet with parchment, then spray lightly with cooking spray. Once the oven is heated, transfer the biscuits to the parchment. Bake for 15 minutes. Use a spatula to flip the biscuits and bake them again for another 10-15 minutes until they are golden. Serve and enjoy! The second Tudor-era recipe I decided to try, inspired by my encounter with the Great English Bible of 1541, was apple mousse. It’s a really lovely fall dish and I think it would make a fantastic addition to any fall feast. It looks like applesauce… so when you go to take a bite, it’s richness and thickness is surprising. It’s another easy recipe and makes a fantastic conversation-starter side dish or dessert! 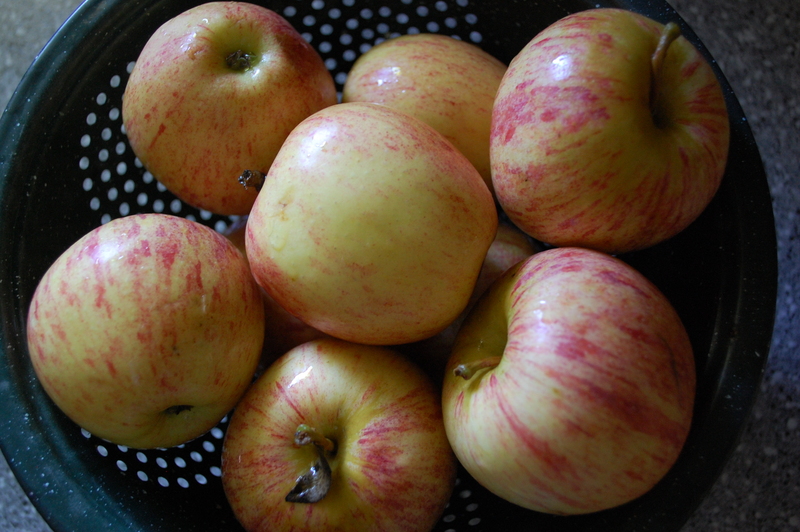 Delicious Gala apples I bought at the Farmer’s Market. They’re so good raw, normally I eat them all before I can cook any apple dishes! This recipe was translated in Tudor Cookery: Recipes and History by Peter Brears but originally comes from A Proper Newe Book of Cokerye published in 1575 by William How. It’s written like this: Take a dozen apples and ether rooste or boyle them and drawe them thorowe a streyner, and the yolkes of three or foure egges withal, and, as ye strayne them, temper them wyth three of foure sponefull of damaske water yf ye wyll, than take an season it wyth suger and halfe a dysche of swete butter, and boyle them upon a chaffyndgdyshe in a platter, and caste byskettes or synamon and gynger upon them and so serve them forth. Got all that? Here’s the easy translation. Put the apples in a saucepan with just enough water to cover them. 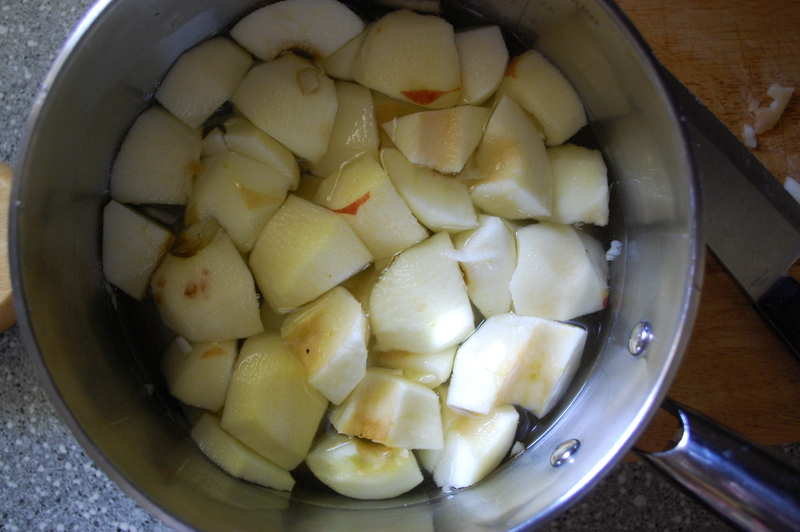 Place chunked apples in a saucepan and add just enough water to cover them. Bring them to a boil, then simmer on medium-high heat until they are mushy, about 30-40 minutes depending on the variety. 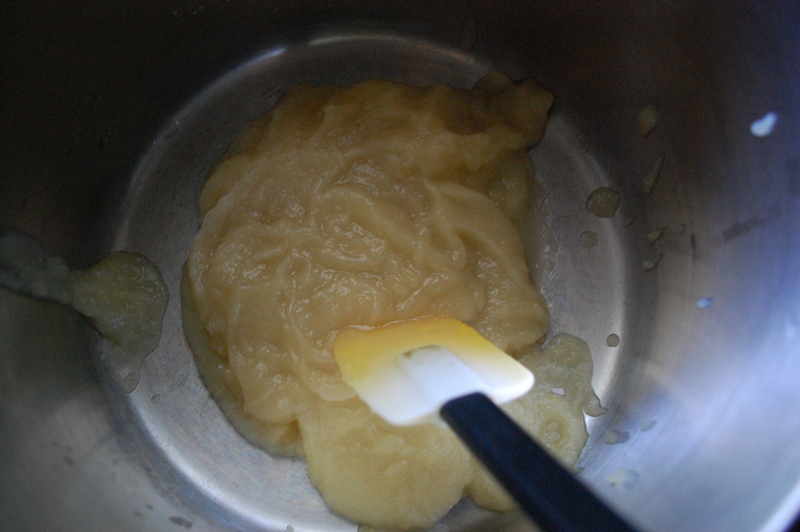 Drain off the water and run the apples through a blender or food processor to puree. At this point, it’s just applesauce. 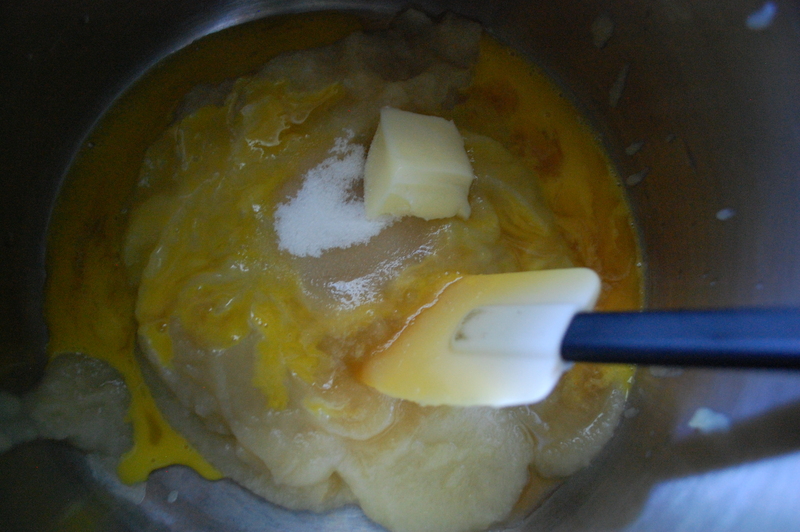 Return the puree to a saucepan off heat, and beat in the egg yolks, brandy or rum flavoring, sugar, and butter. 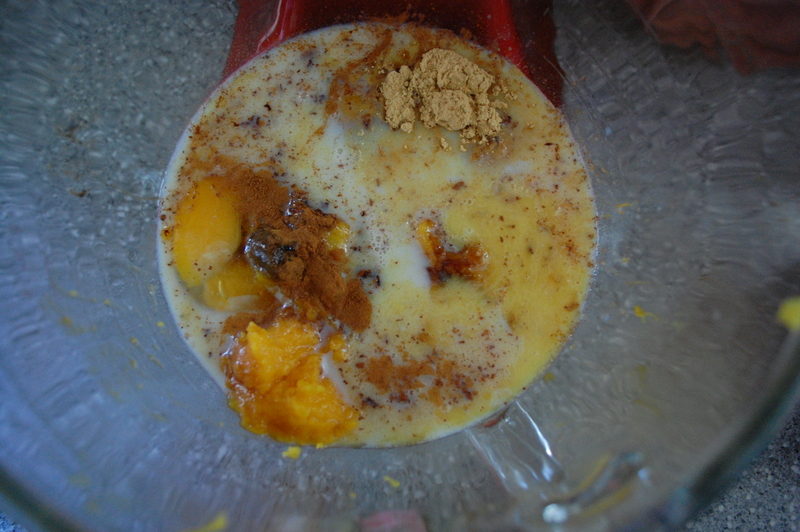 Now the extra ingredients are coming into the mixture. Return the saucepan to the stove and slowly bring the mixture to a boil, stirring constantly. Once it’s bubbling, take it off the heat again and pour it into a dish. Allow this to cool completely before serving. 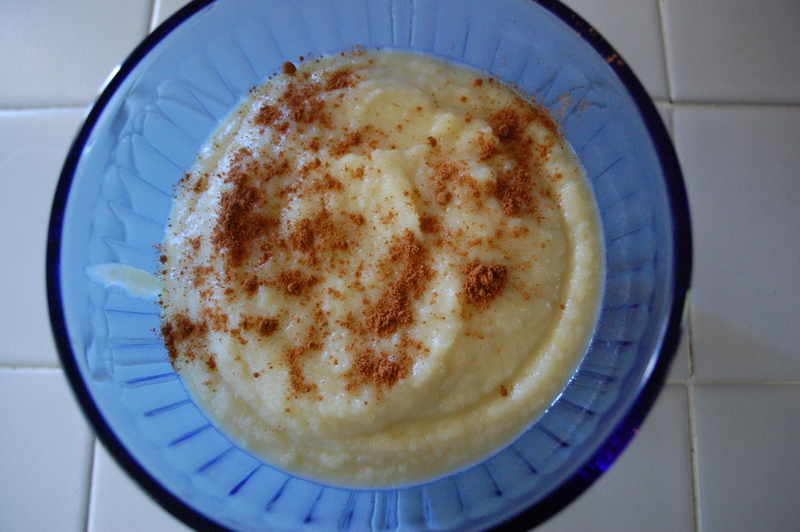 Sprinkle with ginger and cinnamon to finish and serve! I know it looks like applesauce, but it doesn’t taste like it! 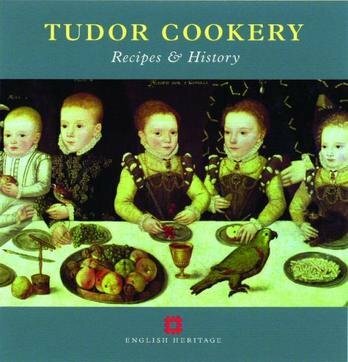 Inspired by my hour with the Great English Bible of 1541, I checked out the book Tudor Cookery: Recipes and History by Peter Brears from my library. The front cover is a detail from William Brooke, 10th Lord Cobham and his Family, 1567 by Master of the Countess of Warwick. Anyone but me wonder how they convinced children to wear those high, starched collars? I love this tiny cookbook for its easy recipe translations and its explanations of Tudor-era culinary trends and table manners. I pulled four recipes to try-the first was for Thick Mutton Stew. The original recipe comes from A noble boke of festas ryalle and Cockery (A Noble Book of Feasts Royal and Cookery) printed approximately in 1500. It’s for a dish called charmerchande, which was basically lamb stewed with sage and parsley. The recipe reads: Take coostes of motton chopped and putte theym in a fayre potte and sette it upon the fyre with clene water and boyle it welle; and thanne take percely and sage and bete it in a morter with brede and drawe it uppe withe the brothe and put it in the potte with the fresshe flesshe and lette it boyle welle togyder; and salte it and serve it. Try saying “Fresh flesh” five times fast…. just kidding. This is a really quick dish to make on a weeknight… I had it on the table in 15 minutes! I served it over chunks of homemade bread with roasted sweet potatoes and turnips for a side dish. It was hearty and delicious and serves three people. Ground Lamb is ready to be turned into a Tudor dinner. Brown the mutton in a deep, greased skillet. 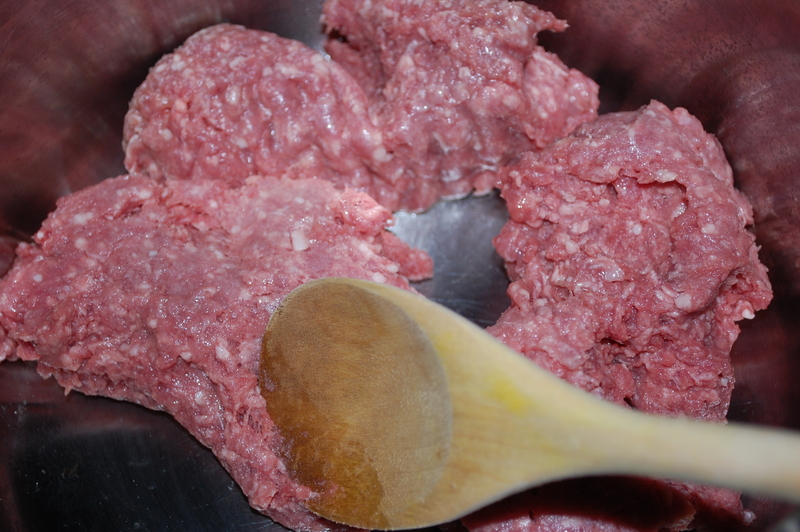 Drain, and add the water, bread crumbs, and spices. With bread and spices, just thickening up. 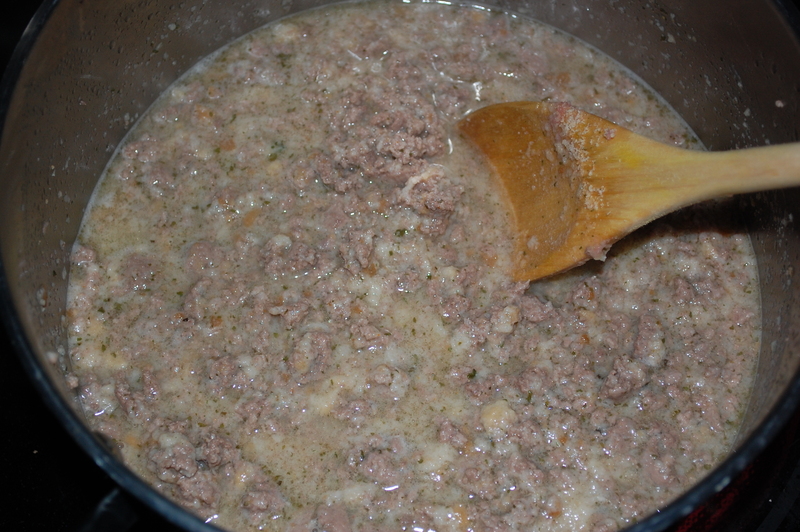 Stir until the bread crumbs have absorbed most of the juices and the mixture is piping hot. Then take it off the stove and serve! Thick mutton stew for a hearty dinner! I got a new job this summer. After 20 years, I left the television news business to become… a librarian! Well, not really. In fact, real librarians will get mad at me for even suggesting I am worthy enough to carry the title. I am now working in the marketing department of the Public Library of Cincinnati and Hamilton County. One of the oldest and most innovative libraries in the nation, you may have heard about it-or seen photos of it-thanks to this Buzzfeed post which went viral the week I started working there. I can’t take credit for it… but it was an awesome way to start my new career. One of the most fabulous perks of my new job is that I get a lunch hour. Sometimes I spend my lunch hour in the rare books room, also known as the Joseph C. Stearn Cincinnati Room, just a short walk from my office. It is my favorite room in the library. Home to our 1848 daguerreotype of the Cincinnati Riverfront, and rotating, museum-type displays, it is where a history nutcase like myself can go to feed a soul yearning to touch the past. 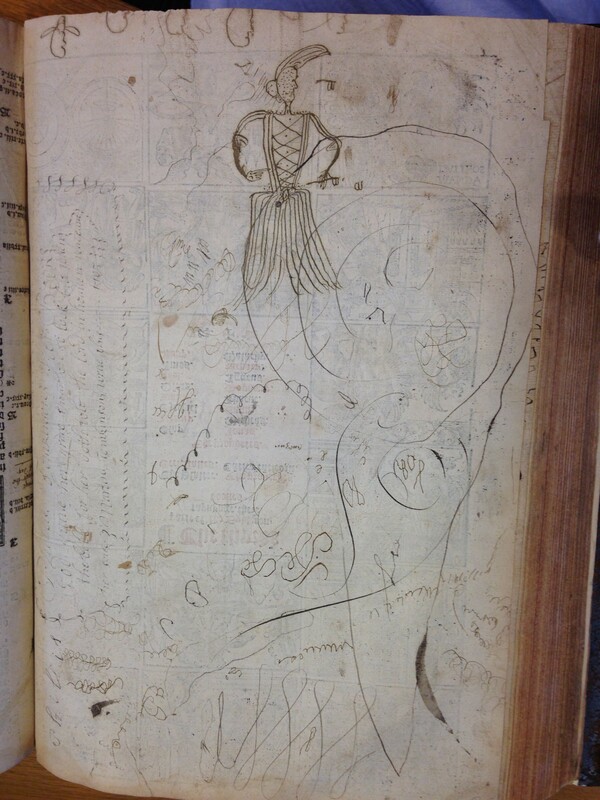 Our library has an entire collection of rare materials which ANYONE can access. There are copies of Gallileo’s work, Syrian tables dating to the ages before Christ, a whole host of ancient texts from a number of religious denominations, and a first-edition print of Jane Austen’s first novel Sense and Sensibility. That was my first lunch hour choice and it was pretty darn thrilling. 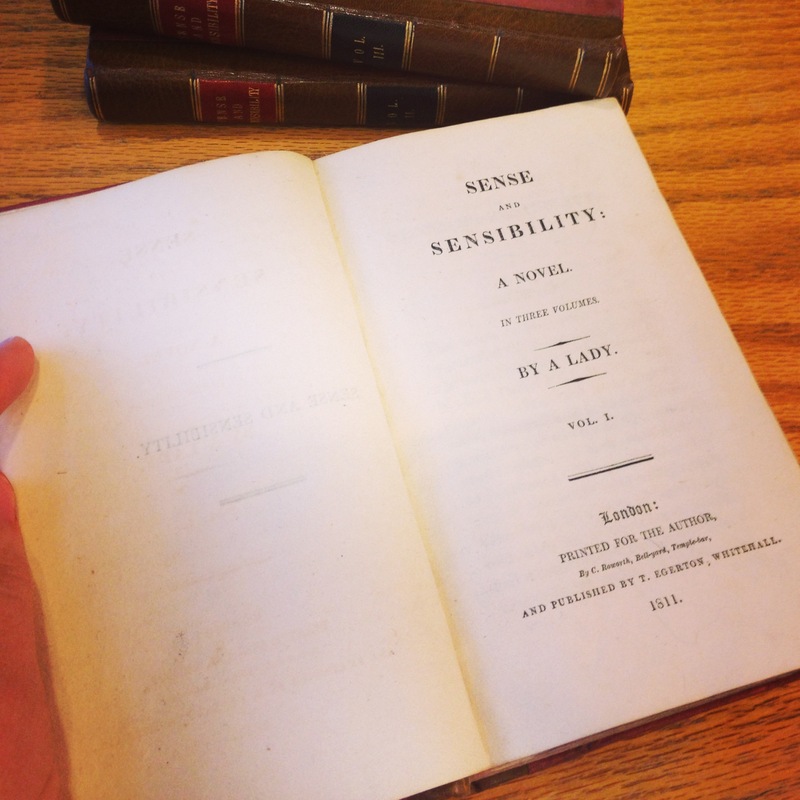 First edition, published in 1811, paid for by Jane because the publisher had no faith that it would sell. But I hit a home run with my second selection and it was so fantastic, I decided to blog about it, even though it’s not food related. Because if you love and appreciate history, especially English Tudor history, you’ll understand why I was giddy for hours after handling this book. 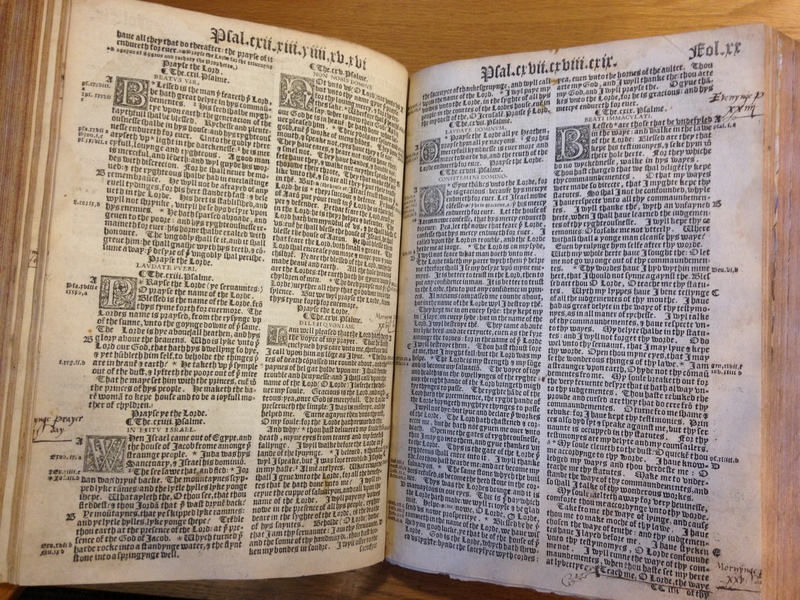 This is the Great Bible, published in 1541. 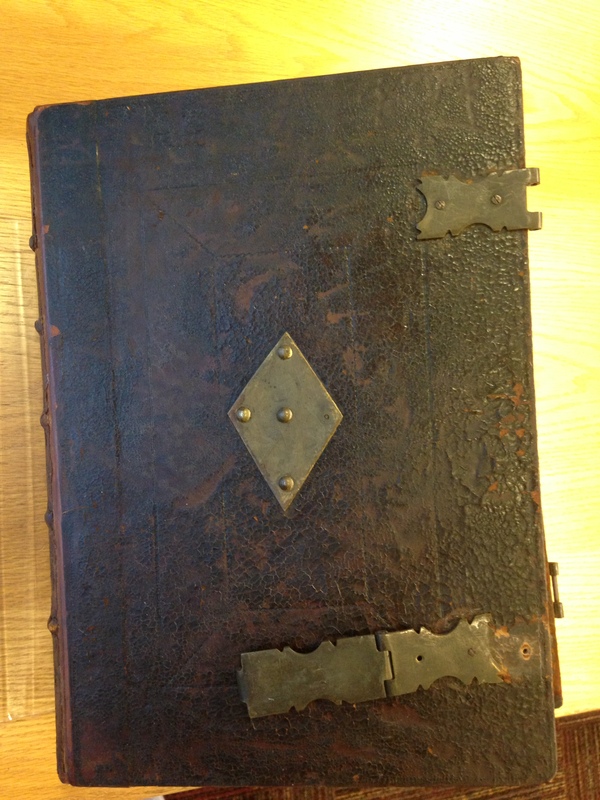 It’s bound in the original cowhide leather with iron hinges. It probably weighs 25 pounds. It’s gigantic and musty and it doesn’t look like much at first glance. The outer cover is made of cow hide leather with iron hinges and decoration. 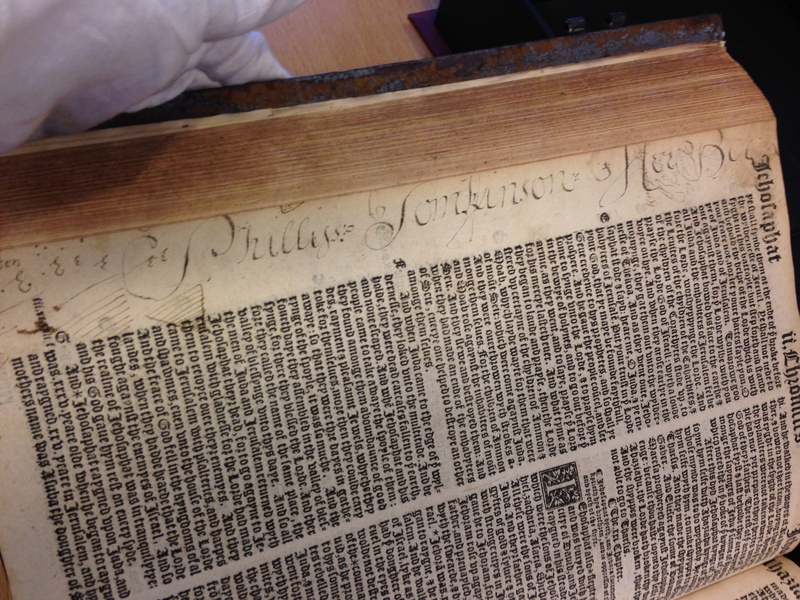 It was printed and assembled in 1541. But when you open it, it takes your breath away. It’s so common to have Bibles in churches, homes, and hotels in this modern time that many people don’t realize the book itself is not very old, when you consider the entire life of the church. The printing press was not invented until 1436, and until that time, the scriptures were on scrolls and parchment. The commission of this particular Bible carries extra significance because up until this point, England had been Catholic and the Catholic church printed the Bible only in Latin, which could not be read by commoners. 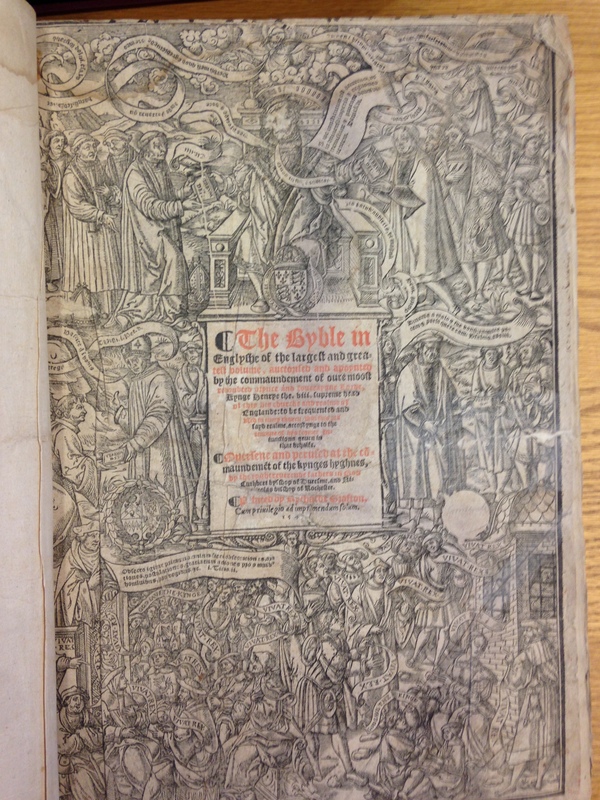 The protestant reformers, led by King Henry, made it part of their mission to make the Bible more accessible to the masses by printing it in English. 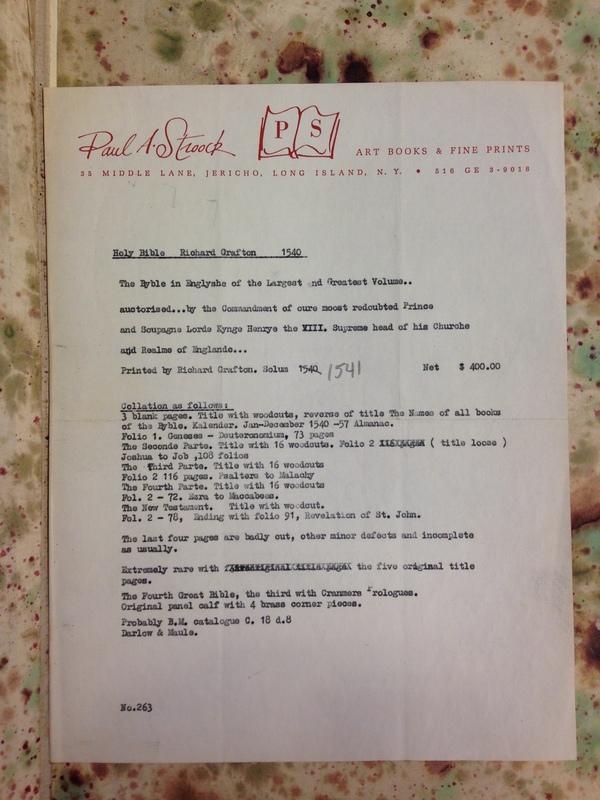 This is a sheet from the appraiser, which lists what is said on the title page. It’s easier to read than the fancy cursive script. The first edition was published in 1539. My library has a copy of the third edition. But our copy is one of the rarer copies in existence, because it still contains the original five title pages. This website explains the image below. 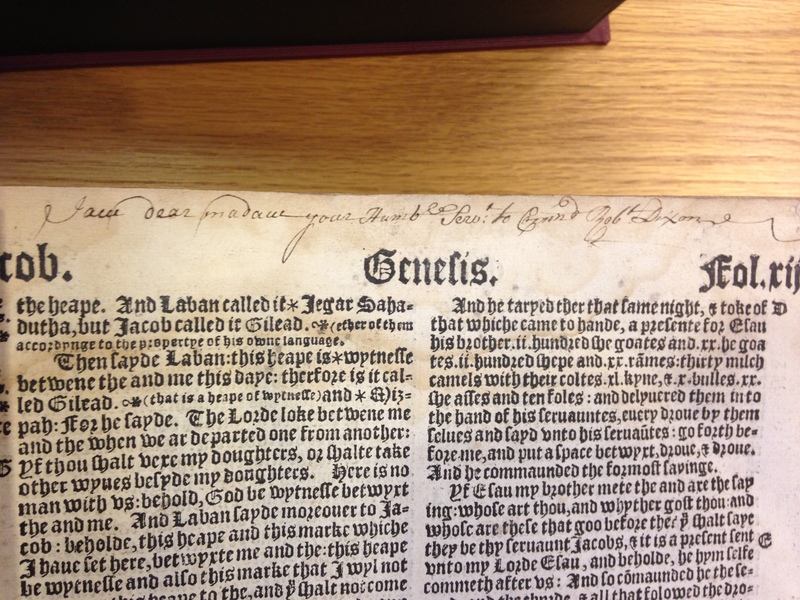 The first edition of this Bible was printed five years after King Henry broke with the Catholic Church, creating his own Church of England, and put himself at the head of the Church. In the span of time between the creation of the Church of England and the printing of this Bible, King Henry married Anne Boleyn, fathered Elizabeth the first, executed Anne, married Lady Jane Seymour, fathered King Edward VI, saw Queen Jane die after childbirth, married Anne of Cleves, annulled that marriage, and was either married to or getting ready to marry his fifth wife, Katherine Howard-whose head would also eventually end up on the chopping block. If you think the reality TV show “Survivor” is hard, you should read more about the Tudor era of English history. It’s downright terrifying. Despite the bloody and contentious history, this book spoke to me the moment I opened it’s covers-not because of Henry and, I’m sorry to say for my pastor’s sake, not because of it’s religious text. 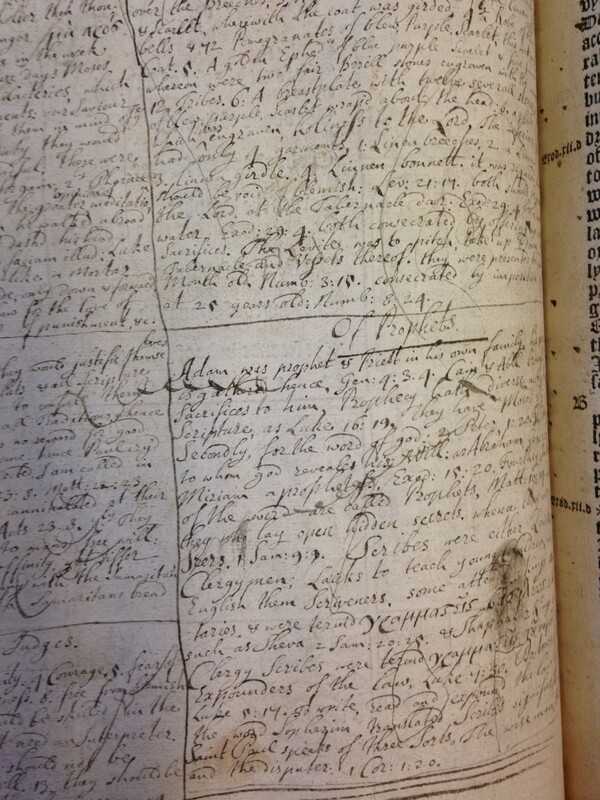 The most breathtaking and fascinating parts were the notes scribbled into the margins of the book, in quill and ink. I can’t decifer exactly what this says except. “Unto no image” and it’s signed Ann at the end. 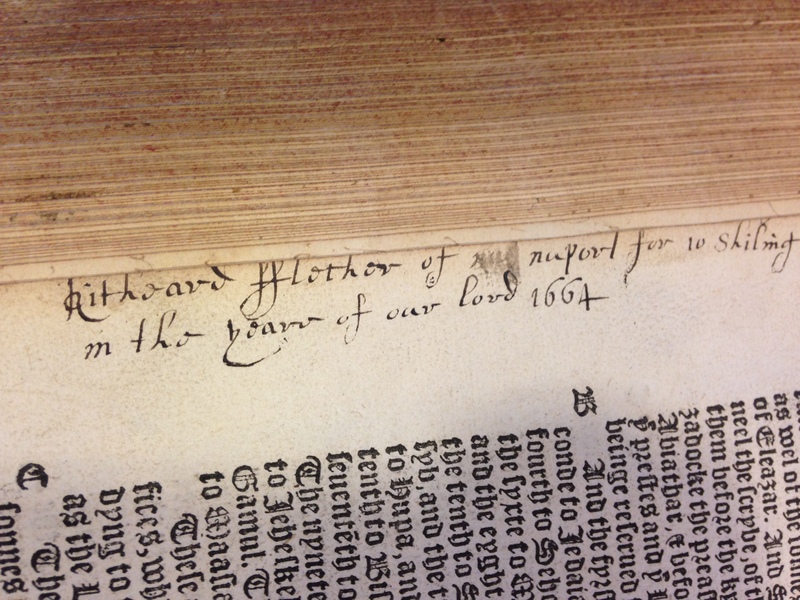 This note seems to mark the sale of something for 10 shillings (about 70 cents in current US money) in 1664. Phillip Tomkinson signed his name. No date. An entire page of notes taken on a blank page. This section is about the Prophets. More scribbled notes. The drawing perplexes me. What the heck is that? 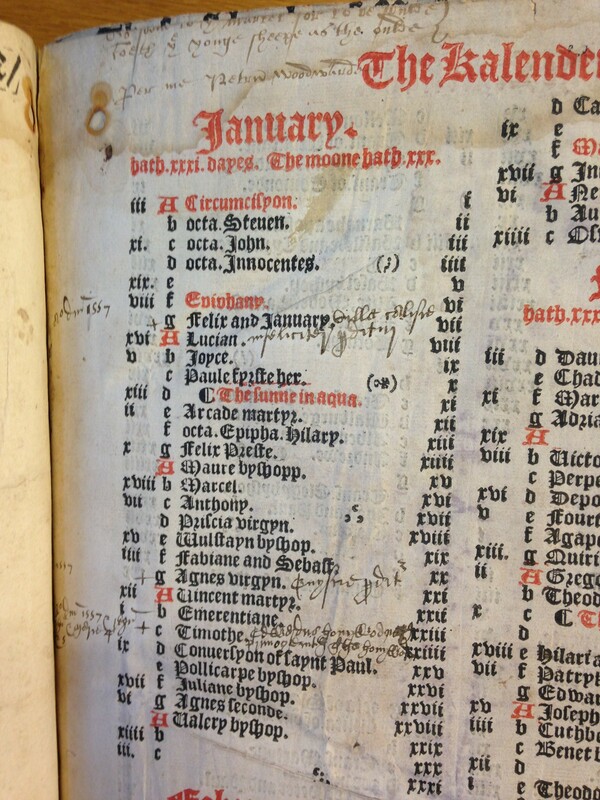 There’s also a fabulous liturgical calendar page with various dates scribbled in, including something notable for 1557. 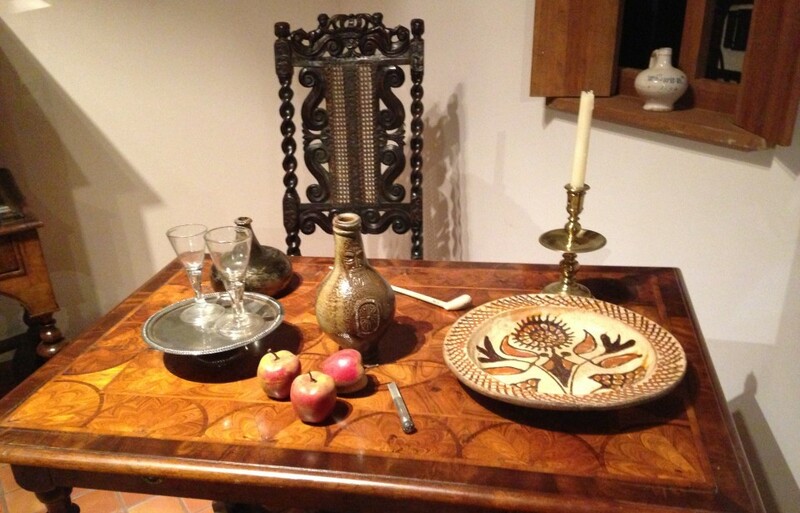 Stay tuned for some Tudor-era recipes. I think it’s about time and I’m inspired now. 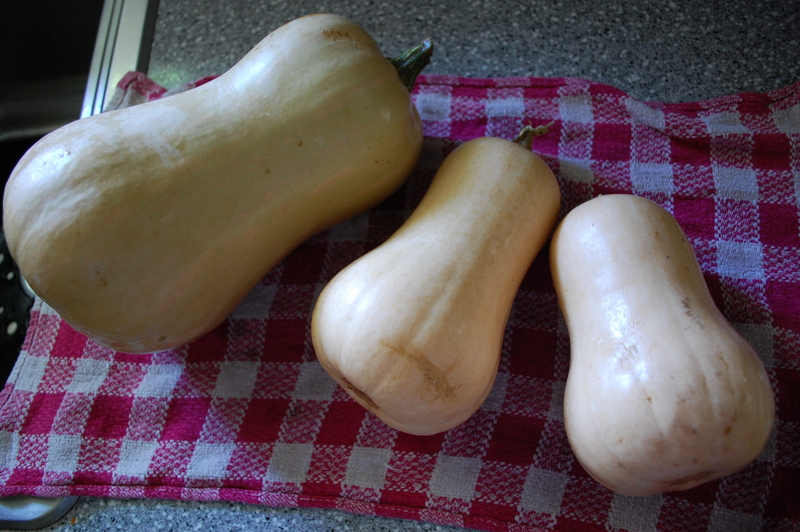 I don’t grow squash. It’s not that I don’t like the vegetable-or is it a fruit? I don’t have room for the vines once they spread out AND that mine always seem to get a mold or fungal infection and die. I leave the squash growing to my friends and family and beg for extras, which I got this year, in abundance. 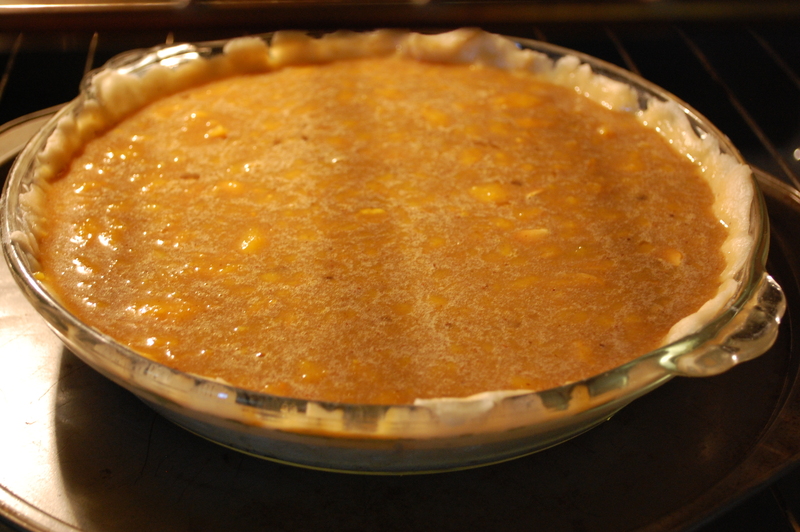 For this recipe, I used three beautiful butternuts given to me by my friend John (thank you!) It’s finally beginning to feel like fall here in Cincinnati, and I was in the mood for pie. This recipe comes from the White House Cookbook, published in 1887. It was very easy to make. It has a LOT of ginger in it-if you’re not big on the spice, you may want to halve that ingredient and add more cinnamon. Anyone who loves a pumpkin spice latte or a chai tea will like this recipe. 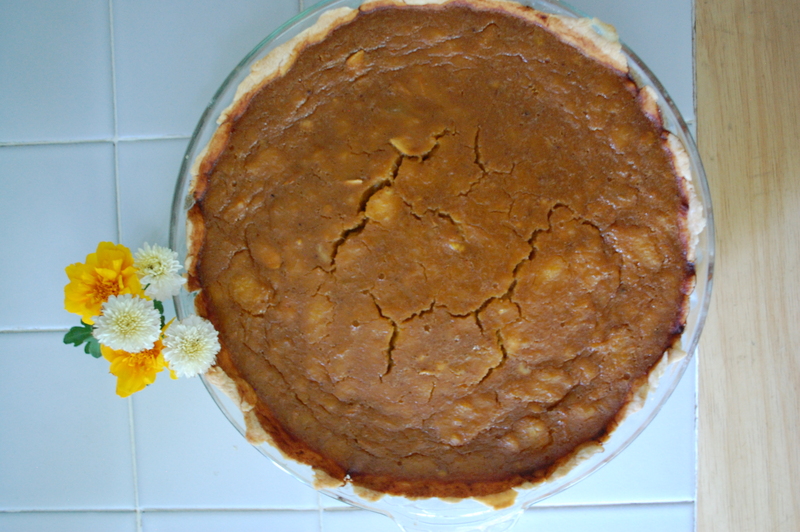 The squash tastes exactly like pumpkin when made into a pie! 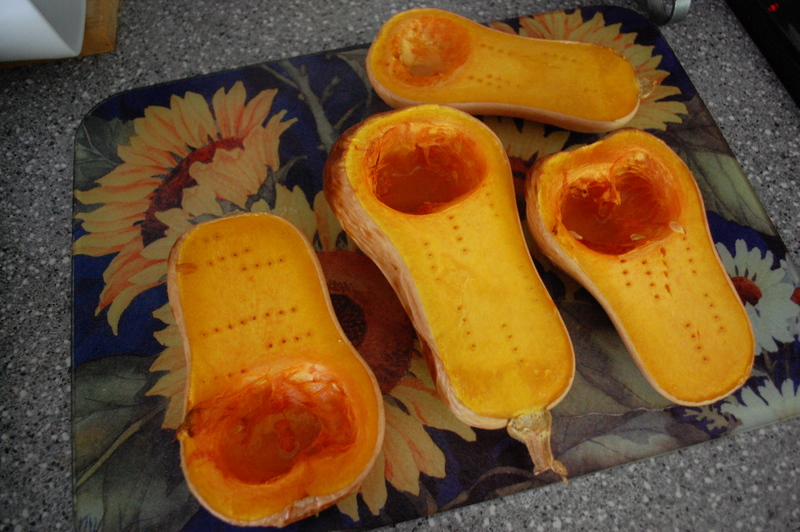 To cook butternut squash, heat your oven to 400 degree. Cut the squash in half and clean out the seeds, which you can roast later just like pumpkin seeds! Poke holes in the flesh with a fork and bake for at least an hour (mine took an hour and a half) until the flesh is soft. Let cool and scoop the flesh out with a spoon. Butternut squash is also great as a dinner side dish, mixed with melted butter. Once the squash is cooked, putting this pie together is super easy. This recipe makes one 9 1/2 inch deep dish pie. Preheat your oven to 425 degrees. Line your pie plate with the shell. Simply throw all the ingredients in and mix. It’s hard to wait until it’s done, at least for me. Pie is awesome! Bake at 425 degrees for 10 minutes, then turn the oven down to 375 degrees and cook an additional 30 minutes. When I took it out, it looked perfect. Later, the top cracked. Further research led me to learn that you should turn you let your pie cool gradually in the oven. Cooling too quickly causes the cracks. It didn’t change the taste though! The Night Before Christmas Movie, ca. 1905.